Design4Growth is a programme to assist micro and small enterprises grow their business through the use of strategic design. The programme is funded by the Department of Business, Enterprise & Innovation (DBEI) and led by the Design & Crafts Council of Ireland (DCCoI) in partnership with the Local Enterprise Offices (LEO) in the South-East Region: Carlow, Kilkenny, Tipperary, Waterford and Wexford. This programme aims to support micro and small enterprises to grow through the strategic use of design and involves a panel of design strategists working with participating companies to identify ways in which design can improve their business. The programme offers over €10,000 in design and business supports. Through Design4Growth, 60 businesses in the South East will have the opportunity to attend information sessions that will provide an overview of the strategic value of design in business. Following the session, up to 20 of these companies will be invited to undertake a design audit. The design audit will help to identify core business challenges that a strategic design approach could resolve. Ten businesses will then be chosen to undertake a series of workshops and one-to-one sessions working directly with a design strategist. Design4Growth provides the opportunity to understand how and where design can deliver tangible value. Workshops will inspire companies to develop products and services and to identify ways to improve customer experience. Companies based in the South East region which have three or more employees and would like the opportunity to be part of the Design4Growth initiative are invited to attend one of two free information sessions. These will take place on Tuesday 17th April 2018 in Carlow and Waterford. The sessions will demonstrate how the latest design techniques can be used to positively impact on business performance and will illustrate how design can play an integral role in the innovation process across all stages of goods and service development and in strategic management techniques and processes. Design4Growth aims to incentivise microbusinesses to engage with designers and assist participating companies in applying the effective use of design in developing their businesses. The programme is delivered on behalf of the Department of Business, Enterprise & Innovation, the Design & Crafts Council of Ireland and the South East Local Enterprise Offices by Targeting Innovation and Sean McNulty, Founder of Dolmen Design. Stage 1: Up to 60 interested businesses will be invited to attend one of two information sessions on 12th April 2018. 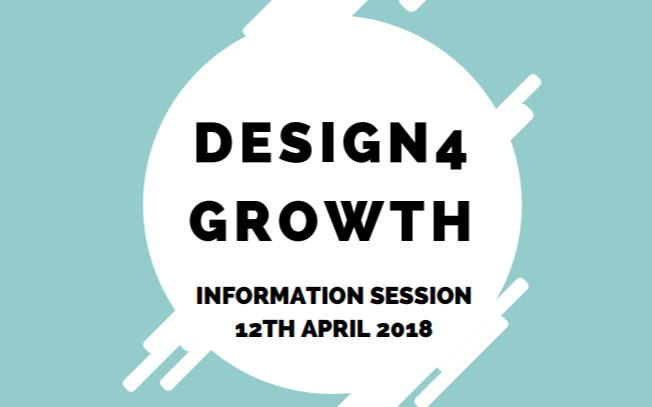 These information sessions are aimed at providing companies with further information on the Design4Growth programme, as well as an overview of the strategic value of design in business development. Stage 2: Up to 20 businesses can avail of a design audit that includes a review by a design strategist with feedback and recommendations on ways in which design could assist with their development. Stage 3: All businesses who complete the design audit will be invited to attend the Design4Growth masterclass on 2nd May 2018. This masterclass will provide the participants with a best practice toolkit for applying design within their businesses. Stage 4: 10 businesses can work with a design strategist to develop a brief for implementing the recommended approach and commissioning the necessary design services. Stage 5: The 10 businesses can apply for design vouchers to a maximum value of €2,500 for design services to implement the brief developed in Stage 3 and receive ongoing advice during this stage from the design strategist. For more details about this initiative, visit here.